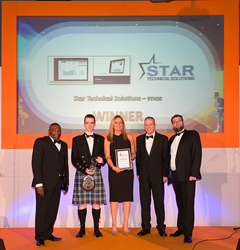 Star Refrigeration’s consultancy arm Star Technical Solutions (STS) has been formally recognised by the industry last night, after winning ‘2018 Refrigeration Product of the year’ at the National ACR & Heat Pump Awards. The ceremony was hosted at the acclaimed Titanic Hotel in Liverpool and was attended by hundreds of industry professionals. The refrigeration and heating consultants developed Ethos, a specialist performance optimisation and energy management system after identifying a gap in the market. Ethos remotely monitors systems by collecting data and carrying out specialised analysis to provide meaningful advice on operational efficiencies to save money and facilitate better informed decisions. The bespoke system has been found to offer customers 10%-30% cost savings based on the recommendations from the detailed and bespoke analysis software. The system model of the customer’s plant calculates the savings, opportunities and inefficiencies to provide insight into what exactly needs to be changed and how much money will be saved as a result. This provides customers with total control over performance and efficiency, which can drastically reduce carbon footprints and save money on energy. Director of Star Renewable Energy, Dave Pearson, another Star Refrigeration company, commissioned an Ethos in the Glasgow Gorbals Sports Centre to accumulate gas consumption data. Pearson said “whether making cooling or heating assessments, data is of paramount importance and not just utility meter data but real time, short interval logged data of actual hot water use. This will allow us to correctly size a water source heatpump harvesting heat from the Clyde to save money and reduce CO2 as well as eliminating local NOx emission for the heat provided. ETHOS is key in this assessment."